I did not plan to watch Seven Days in Utopia until I saw a commercial for it saying that this was "a film every Christian should see". Believing myself to be a Christian, I took that as a challenge and so I did as I was told and saw it. Based on the book Golf's Sacred Journey: Seven Days in the Links of Utopia by Dr. David L. Cook, the film uses golf as a metaphor on how to reach a more important goal: in Dr. Cook's view, a personal relationship with Jesus Christ. I don't find much in Seven Days in Utopia that will cause offense though I'm never big on films whose whole raison d'etre is to give a message, even if I agree with it, but in terms of actual storytelling, that's another matter. Luke Chisholm (Lucas Black) is having a very bad day. Not only has he fled the golf course after having a very public 'meltdown' with cameras present to record everything, (though I wonder if his behavior on the links can actually constitute a 'meltdown'), but his own father/caddie Martin (Joseph Lyle Taylor) has added to his hurt and humiliation by walking away from his son, leaving him alone at that golf course. In his anger and fury, Luke drives through the Texas countryside, and when he reaches a crossroads, he turns towards the town of Utopia. He's so filled with anger that he barely misses a steer in the middle of the road, having become distracted by a golf flag in a field, and crashes onto the property of Johnny Crawford (Robert Duvall). Seeing as his car will not be ready for about a week, Johnny encourages Luke to stay in Utopia. Side note: I found Utopia to be the whitest town in the whole state of Texas, and the lack of color in the population: no blacks, no Hispanics, is not only disingenuous but slightly creepy to me, but I digress. He checks into the lodge and discovers as can only happen in movies, that Johnny himself was once a golf pro. In the seven days Luke stays in Utopia, he quickly falls for Sarah (Deborah Ann Woll), the pretty daughter of Lily (Melissa Leo), both of whom are still in mourning for Sarah's father after two years, runs afoul of Jake (Brian Geraghty), a local rodeo star who is sweet on Sarah (though his feelings are not returned), and learns life and golf lessons from Johnny. Among the things Johnny teaches Luke are to "Find Conviction", "Emotional Control", and "Confidence Comes In Being Prepared". All these life/golf lessons are boiled down to a catchy slogan, in this case STF (See It, Trust It, Feel It). Having been set right in Utopia and I believe having given his life over to Christ(I cannot remember for certain), Luke now has a new outlook on life. He goes back home, reconciles with his dad, and together go to the Texas Open, where they again face off against the legendary Korean T. K. Oh (Korean golfing star K.J. Choi). Seven Days in Utopia ends with a final match-up between the golf superstar and the underdog, and in true film style, it's down to sudden death. Does Luke make the putt? Well, to find out, the film directs you to a website (Did He Make the Putt.com) to find out. I decide I'd bite. On the site, Dr. Cook reads us the first chapter from the sequel, and the answer is yes, he does, and in Luke's acceptance speech he talks about his new life. While not using the name of Christ, he makes it clear whom he's talking about. Seven Days In Utopia has a message, but that's where its problems begin. I don't have a problem with the message per se (finding a more fulfilling life not from your work but from God), but it all goes so quickly I never saw where God came into the picture. Nowhere in Seven Days In Utopia did I get a sense that the Gospel was either overtly preached or subtly placed in Luke's heart, and it isn't until the end that any sense of conversion is placed and in a remarkably rushed and horned-in manner. How Luke's outlook changed from a self-centered worldview to a God-centered one we really don't know or see, and given that this film is being marketed to a Christian-oriented audience, it's even more remarkable that the message of Jesus isn't more obvious or open. Most of the time between Luke and Johnny was spent in their week together in this Mr. Miyagi/Daniel-san type apprenticeship where the old man teaches the younger man not just how to improve his golf but those valuable life lessons. In one day, we have them go fly-fishing. Now, what does fly-fishing have to do with golf apart from perhaps eye-hand coordination and arm/hand control? It is to teach rhythm, balance, and patience: all skills Yoda must instill in Luke (pun intended). When Johnny has Luke paint to imagine how he will make his shot, I wrote in my notes "a painting lesson: wax on, wax off". 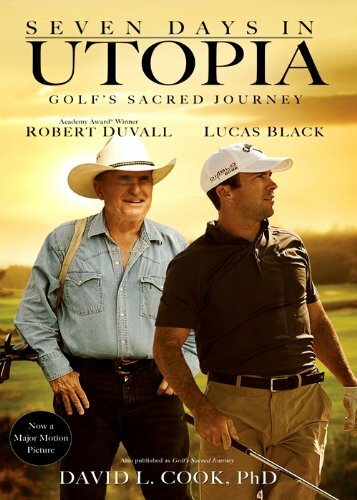 While there is nothing wrong with using unorthodox methods to improve certain sports skills, Seven Days In Utopia never made a case that Luke was actually improving his golf game with them. If you're going to show a character improving their skills, let's see them improve said skills, not run around the rodeo which made the hour-and-a half movie feel even longer. Another tremendous problem in the film is how the past was mixed in with the present. Robert Komatsu's editing was a jumble: we see how Martin pushes his son to becoming the golf pro although we never learn why he has this obsession to build a new Tiger Woods; did Martin love the sport, did he feel a need to build his son into his idea of what a man should be? We never learn. Whenever Luke's memories appear, they seem to come out of nowhere to where you wonder in what context they come (dream, triggered memory, plot exposition?). Whatever backstory Luke's troubled relationship with his father is goes wrong two ways: not only is it poorly described, but the reconciliation is both poorly directed and worse, done so quickly it becomes unbelievable. I have a belief, if not an actual Golden Rule of Filmmaking, which involves screenplays. The maximum number of screenwriters should be three, ideally one, so as to keep cohesion within the story. Seven Days In Utopia has four: Rob Levine, Sarah Thrift, director Matthew Dean Russell, and David L. Cook himself. I can't help wonder if Seven Days in Utopia would have worked better if Dr. Cook had worked on the screenplay by himself from his own novel, or at the most worked in tandem with director Russell. As stated, the seven days themselves go way too fast on screen to show there to be any conversion on Luke's part to the core of his soul. Even worse, the story has a load of clichés to it. What are the odds that Luke would meet a former golf pro brought down in his prime by his own demons? What are the odds that a pretty young thing would take a shining to him and vice versa? What are the odds that a love rival would be there? Side note: the love triangle was both quite small and done away with quite quickly. In one afternoon, these fierce rivals for the affections of the local pretty girl, Luke and Jake, end up becoming fast friends. Again, unbelievable. 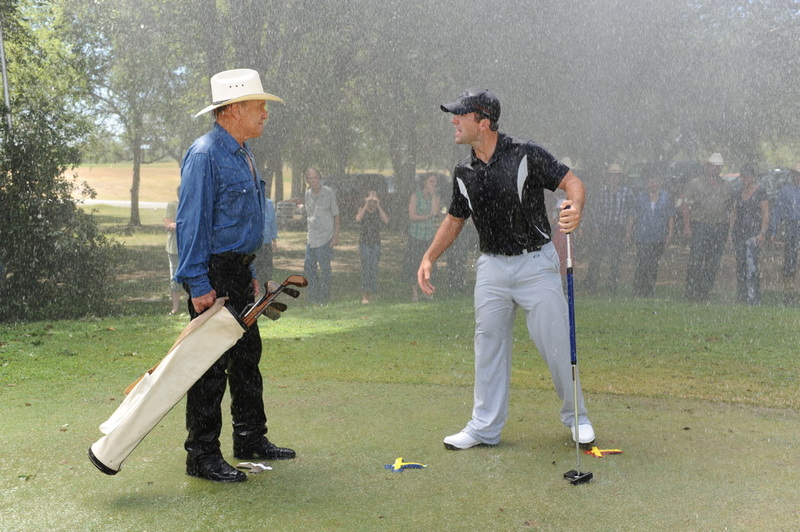 What are the odds our redeemed golf master would face up to the titan of golf that had brought about his 'meltdown'? What are the odds that it would come to sudden death between them? What are the odds that the golf club that Luke was told he would use 'when the time was right' would be used 'when the time was right'? One last thing about the negatives in Seven Days In Utopia. If there is one thing about films that I am not a fan of, it's the voice-over. Granted, it can be done well (Sunset Boulevard, Blade Runner), but it really should be done sparingly and it takes a great deal of skill in both screenwriting and directing to pull it off. Seven Days In Utopia has neither. To its credit, it only had Duvall's voice-over at the beginning and end of the film, but the closing voice-over only made the actual screen ending worse. In the performances, only Black and Duvall managed anything of note. Lucas Black I remember from The Fast & The Furious: Tokyo Drift, and the most memorable thing about his performance in Tokyo Drift was his thick Southern accent. Here, he again has a thick accent. Voice aside he did a good job, especially at the end where he's facing a literal hit-or-miss scenario: that quiver in his lips and his eyes welling up shows an emotional range that perhaps hasn't been appreciated before. Duvall did what he could with a remarkably underwritten and cliche-filled part as that of the wise elder Johnny. In fact, I'd argue that the screenplay failed everyone in Seven Days In Utopia. You have Melissa Leo, fresh off an Oscar win for another sports movie (The Fighter) and both the film and filmmakers don't appear to know what to do with either her, her character, or her story. She's suppose to be the widow of Johnny's best friend who helped him back onto the path of righteousness, but her story never appears to be even remotely relevant to what is suppose to be the plot of the story (hot-head golf pro learns that God is more important than Glory). Is she there only because she's Sarah's mother? If so, then neither her nor Kathy Baker (as the innkeeper) are necessary. Woll's character of Sarah appears to be there to add a romantic angle to the story, but given how she rebuffs Luke and doesn't appear to eager to be with Jake, again, why have her there? I'll give Geraghty some due: he, like Duvall, did the best he could with yet another useless character. The most incredible thing in terms of acting in Seven Days In Utopia is that you have Jerry Ferrara (aka Turtle from Entourage) on screen for about a minute and you wonder three things: 1.) Is that Turtle?, 2.) What's he doing here? and 3.) Where did he go? Now, on to the ending. First, am I the only one that thinks naming the golf titan T.K.Oh is just a bit silly? What, they couldn't work in even a good pun (which is what I figure they were going for)? T.K. Oh. Let that settle in for a moment. The name of the rival is T. K. Oh. Second, you have this big build-up to this epic confrontation between T.K. Oh and Luke Chisholm, and the ending is just flat-out unfair. How is it unfair? Well, unlike better match-ups in films (like that between Rocky Balboa and Apollo Creed in Rocky) we don't see the conclusion. We're taken to this big moment, and just before we the audience know for certain whether all that training, physical and spiritual, paid off or whether in the end he was knocked out by T.K. Oh, the camera pulls up, we get the voice-over from Duvall asking us if it matters at all if he made the putt or not (answer, yes, because then we have a conclusion one way or another), and then the screen directs us to that website where we get to hear from Dr. Cook. It all leads me to think Seven Days In Utopia isn't an actual film but a proselyzing product placement infomercial. It brings to mind all those films the Billy Graham group made, but at least they were open about their endeavors. They weren't trying to fool anyone into thinking their primary goal was anything other that to use film to spread the message of Christ. When it comes to Seven Days In Utopia, even it that were its only reason for being I could forgive. What I can't is that it was done so poorly.